We are able to offer the Foyer and the Atrium as spaces to be booked for events. We usually offer the Library Foyer to student groups and societies; to promote cycling and personal safety; for student fund-raising etc. 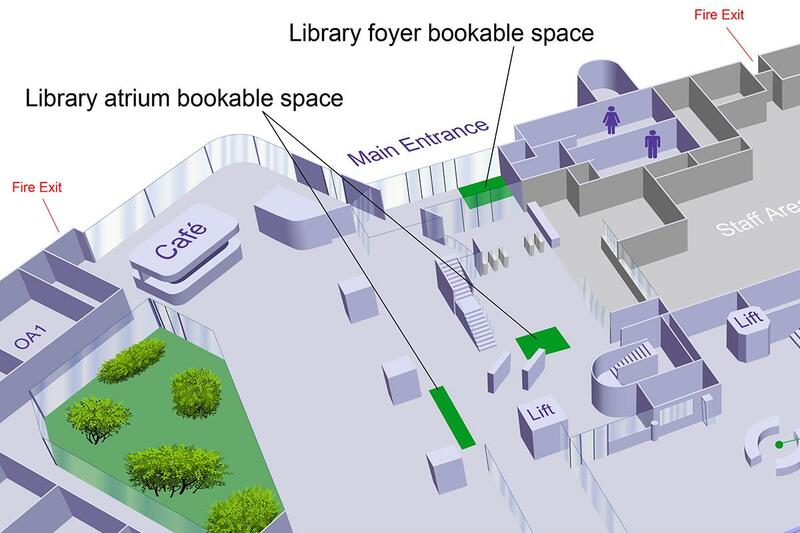 The Library Atrium is primarily used for University events, such as viewing the Estate masterplan, promotion of University strategies, ‘Haver with Harriet’, Student Well-being, Student Finance promotions. The Atrium is also used by the Library for promotions of our service and pop-up sessions. Neither space is large enough to offer double bookings, so we can only offer one event at a time in each space. Foyer – table and two chairs – are left in the Foyer area, ensuring that the exit routes are not blocked. Atrium – table and two chairs – are left in the Atrium, ensuring that the stairs and the exit routes are not blocked. Please provide us with details of the type of event you would like to hold: for which charity or society or organisation; whether you want to give away or sell food and drink; what dates/times you would like to hold the event. Contact us at library@port.ac.uk preferably with two weeks notice. We recommend you consider term-time, Monday - Friday, between 1000 - 1800 to reach the majority of students using the Library. If you wish to give away or sell food and drink at the table, please ensure that you provide only shop-bought food and drink and retain any packaging for reference for those with allergy or other food enquiries. Please also ensure that the food is covered. You are not able to give away or sell homemade food or drink. you leave the area tidy and clean (particularly if your promotion involves food and drink). the table remains on the left-hand side of the foyer (as you enter the Library). You must not position the table on the right hand side of the foyer (as you enter the Library), as this is a exit route if there is a fire alarm. Library users are not prevented from entering and leaving the space, either by the table and chairs or by the people staffing the table.